Joe Odagiri and Tomokazu Miura take a walk in Adrift in Tokyo. Relaxing, funny, and even a little touching, Adrift in Tokyo is an enjoyable and accomplished serving of weirdness from director Satoshi Miki. Tomokazu Miura and Joe Odagiri make a terrific pair. Also, their hairstyles rock. There's more besides quirk in director Satoshi Miki's Adrift in Tokyo. The esteemed auteur of more weird movies than any filmgoer probably requires, Miki has a gift for finding the odd yet endearing in hidden corners of everyday life. Adrift in Tokyo follows the adventures of two men - a debt collector (Tomokazu Miura) and a deep-in-debt, eighth year law student (Joe Odagiri) - as they go on a languid, foot-propelled road trip. Yep, there are no cars on this road trip. The two walk all over Tokyo, ruminating on their lives, making small observations, and finding connection where there perhaps was none before. They also ride a roller coaster. The above sounds partly like arthouse cinema in that post-modern, soul-searching kind of way (minus the roller coaster, of course), but if Adrift in Tokyo does any soul-searching, it's rather cursory. There's perhaps some navel-gazing along the way, but none of it is acutely existential; most of the gazing here is outward, observing just how strange, weird and even pleasant things are when you stop and take a good long look. However, there's affection and even understanding in the journey, making Adrift in Tokyo more than just quirk for quirk's sake. This is a road trip with simple, enjoyable, warmly funny pleasures. 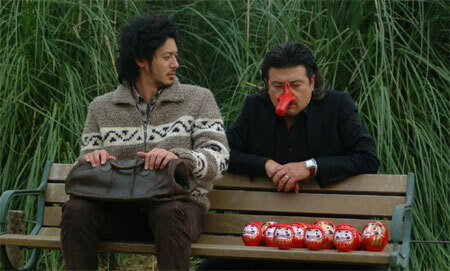 Joe Odagiri's trademark crazy hair and funky sweater are just the icing on this enjoyable cinema cake. We first meet debt collector Fukuhara (Tomokazu Miura) when he's stuffing used socks into the mouth of law student Takemura (Joe Odagiri). The footwear force feeding is Fukuhara's way of getting Takemura to pay back his debt, and Takemura wants to oblige, but is strapped for cash. However, when he meets Fukuhara again, the elder gentleman has a new proposition: join him on a walk around Tokyo for a few days and he'll pay Takemura one million yen. Fukuhara has done something that will require a long incarceration, and before he goes to the police, he'd like to walk around, see some sights, and visit a few old haunts. Takemura agrees because the payoff will clear him of his debt, but he also warns Fukuhara that the sooner he turns himself in, the better. Can Takemura convince Fukuhara to go to the police before the cops start a manhunt? Well, no he can't, and it doesn't really matter. If you hear a ticking clock in Adrift in Tokyo then it's only your wristwatch; there's little urgency or forward momentum in Satoshi Miki's aimless celluloid stroll, and the details are less revealing than they are simply curious. The film covers a myriad of topics, including but not limited to: cosplay, street performers, fake marriages, annoyingly perky teens, and small Tokyo retail establishments that conceivably have no way of paying their monthly rent. There's also a detour to meet Fukuhara's fake wife, a club hostess played by Kyoko Koizumi, and a subplot involving Fukuhara's real wife, whose absence from her job bothers her co-workers. Not that that really matters either; they're too busy comparing the smell of their hair, or debating whether or not it's good luck to run into actor Ittoku Kishibe on the street. A gripping time at the movies this is not.